Home / Uncategorized / Should Gun Laws in New Jersey Be More Strict? 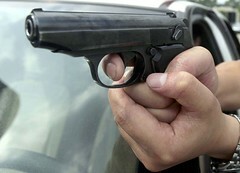 Should Gun Laws in New Jersey Be More Strict? The tragedy at Sandyhook Elementary School earlier this year reignited a debate that has persisted over decades in our country: to what degree, if at all, should states or the federal government limit access to firearms? From state to state, access to fire-arms varies dramatically, from extremely stringent background checks to very liberal laws permitting possession of firearms in public areas. The state of New Jersey is more like the former group of states than the latter when it comes to gun-control, imposing restrictions on the purchase of guns and other weapons. Gun owners in New Jersey are more than familiar with these laws. Most prevalent are background checks, which look at a prospective gun owner’s history before allowing guns to be purchased. Mental illness, a criminal history or other red flags can disqualify someone from being able to purchase a gun. Are Gun laws in NJ likely to change? In New Jersey, lawmakers from both parties are arguing over new proposals to broaden gun control laws in the state. While Democrats want a very expansive suite of gun-control provisions, the legislative package proposed by New Jersey Republicans is also very strict, addressing access to guns in four areas: mental health, media, criminal law and gun laws. Governor Christie’s suite of proposed legislation includes statutes modernizing the cards used to identify New Jersey gun owners to increasing limits to the access of violent video games. Governor Christie also wants to revamp some existing laws; for example, convicted criminals will be prohibited from purchasing weapons in an expansion to the current slate of background checks. The transferring of firearms and other similar loopholes are also addressed; buying ammo when you are prohibited from owning guns will become illegal. An interesting dimension to the gun control laws proposed by each side is a renewed emphasis on mental health. Gov. Christie and legislators in both parties seem intent on tackling the root causes of gun violence, including potential mental instability. Gov. Christie’s proposals include statutes that would make the involuntary commitment and treatment of potentially violent individuals easier, and increase the role mental health screenings in the background check process. All in all, the proposed laws are not dramatically different than existing gun control regulations. If you’ve purchased guns in this state before, you’ve already been subjected background checks and similar requirements. The laws proposed by both state Democrats and Republicans expand these laws but not in huge ways – New Jersey has a history of strict gun control. Whether New Jersey gun control laws become stricter or stay the same, the debate over the legal access to guns will continue. Do you think states and the Federal Government should stiffen gun control laws? Click here to vote “yes” or “no” and give us your feedback on this important issue; the results will be posted on our Facebook page.